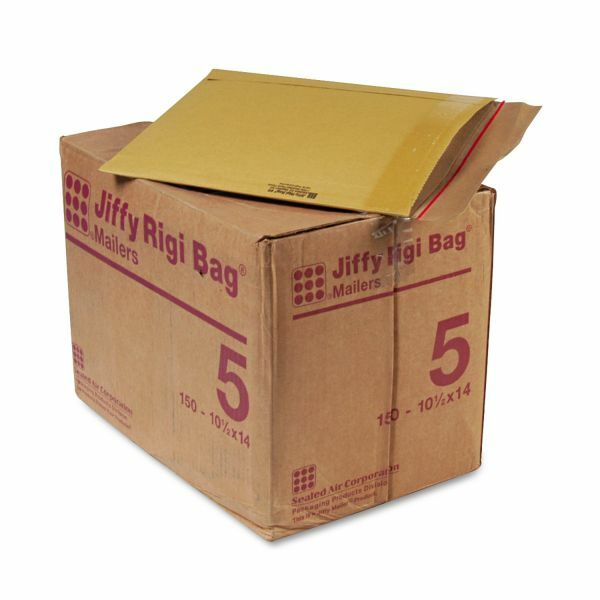 Sealed Air Jiffy Rigi Bag Mailer, #5, 10 1/2 x 14, Natural Kraft, 150/Carton - Jiffy Rigi Bag Mailers are made with an extra-rigid, kraft-laminated fiberboard construction that effectively resists bending and folding while providing superior edge and corner protection. These mailers are the perfect way to ship books, photography and other low-profile items that require rigid mailing protection. Stiffness allows quick, easy product insertion. High-strength cohesive self-seal provides a secure closure and speeds up a packaging operation. Tear tape in the flap facilitates easy opening. Attractive, satin gold kraft has a premium appearance and provides an excellent surface for custom printing. 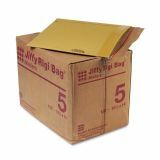 Mailer contains a high percentage of recycled material.